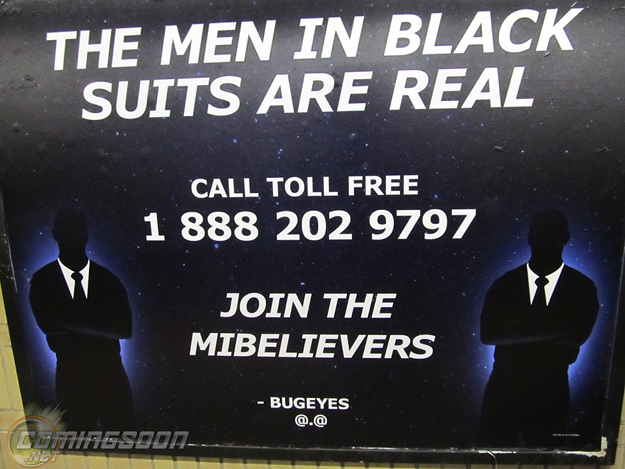 We just shared the new trailer for MEN IN BLACK 3 this morning (watch HERE) and now Coming Soon has shared this poster they caught in the New York subway and we have it right here for you. Keep your eyes on themeninblacksuitsarereal blog, supposedly ran by "BugEyes 126", a 14-year-old kid who posts information that he believes to be relevant in tracking down proof of extraterrestrial life. By calling this number (1-888-202-9797), fans have the option to leave messages about their own alien encounters with the suggestion that the recordings may be used in a future stage of the viral. Men in Black 3 hits 2D, 3D and IMAX theaters on May 25th.